I'm slightly drugged at the moment so bare with me if things get a little cray cray :p ! Haha ok so I'm not really that drugged but, you know me (just a tad dramatic!). Anyway it is the end of day three, over halfway done! The rest of yesterday wasn't too bad. 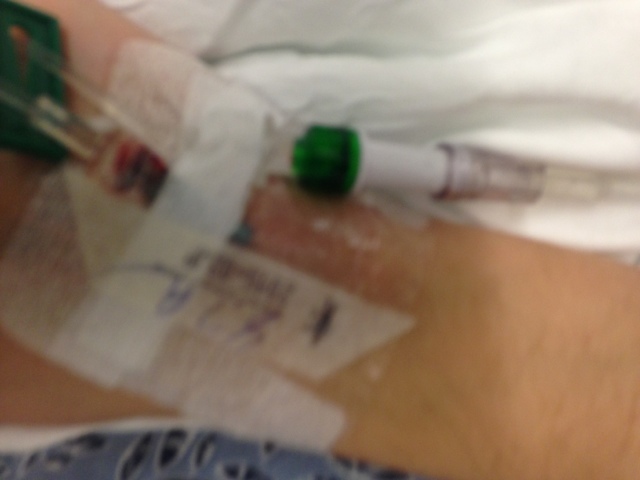 I did get my first ever arterial blood gas draw though which was a little rough. It hurt, it wasn't THAT bad but my body decided that it was and decided to bail. Luckily this wasn't the first time that had happend to me after being poked, allowing me to know sugar would bring me back to the world. I got it just in the nick of time and returned from the quiet white world I was passing through on my way to nothingness. (Yes, I'm talking about nearly passing out!). Anyway besides that little fluke the rest of, the rest, of yesterday went pretty smooth! Today I had my heart catheterization which was not bad. It's funny cuz I was the most nervous about it yet it, so far, was the easiest of the bad sounding tests. It was also done fast, for hospital time! I was able to go back to the house and take a nap (did I mention I was drugged?) and see a movie at the theater! We saw White House Down. It was pretty good and I liked having a break from hospitalness for a bit! don't let the bed bugs bite, you blogollowers!